Triple format TV receiver in one half height board! Includes WinTV v7 HD application for High Definition TV viewing and recording! High Definition digital satellite DVB-S2. Schedule your TV recordings with WinTV v7 HD's built-in scheduler. Includes Hauppauge remote control for easy operation of all WinTV v7 HD's functions. WinTV-HVR-4400: the best Triple-mode TV receiver for your PC! WinTV-HVR-4400 is a four-in-one TV tuner which can receive four different television formats: analogue PAL/SECAM TV, Freeview digital terrestrial DVB-T, digital satellite DVB-S and High Definition digital DVB-S2. 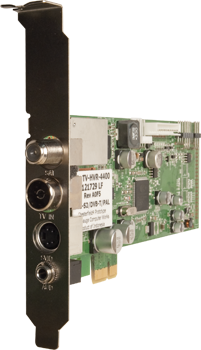 Watch and record analogue TV, digital Freeview and High Definition digital satellite TV, all from one PCI-e board! Digital TV now comes in High Definition. High Definition DVB-S2 satellite TV brings the ultimate TV ecperience to the PC screen. HD gives you the best quality video and CD quality audio. Record movies in the full HD H.264 format to your PCs hard disk! But if you cannot currently receive high definition digital satellite TV, the WinTV-HVR-4400 can still be used to watch and record analogue TV, Freeview or standard free-to-air digital satellite TV. Analogue PAL/SECAM TV on your PC screen. Connect WinTV-HVR-4400 to a rooftop aerial and you can watch and record TV programmes to disk. Record your TV shows (or your home videos) using 'Good, Better or Best' MPEG-2 compression. You can also receive analogue teletext. Digital Video Recorder: Record analogue, DVB-T or DVB-S TV in high quality MPEG-2, or high definition digital TV in H.264! Use WinTV v7 HD's TV scheduler to automatically record your favourite TV shows, on a daily, weekly or once only schedule. Or use the built in Electronic Program Guide for digital TV to have an overview of all up coming programmes! Hauppauge's remote control makes the WinTV-HVR-4400 easy to use - Control all the Media Center's functions of WinTV v7 HD with the ergonomic remote control. Change Channels, adjust audio volume, start recordings, play music, start a slide show, all from the comfort of your living room couch! The WinTV-HVR-4400 supports DVB-T TV not DVB-T2. To use the WinTV-HVR-4400 for TV with the Windows XP Media Center application (DVB-T/Analogue, DVB-S will also work but will require a patch from our website) a Media Center certified DVD or MPEG-2 software decoder is required. If you are building a Media Center PC, refer Microsoft's web site for a list of Media Center certified DVD decoders. The Windows Media Center application is included with Windows XP Media Center, Windows Vista Ultimate and Windows Vista Home Premium editions only. The enclosed remote control is not MCE certified and does not replace Media Center remote control.